Optical properties of graphene will be reviewed, including the manifestation of chiral properties of electrons in ARPES, absorption of light by monolayers and bilayers, and magnetooptics. Signature of electronic excitations in Raman and theory of magnetophonon resonance will be discussed, with reference to recent experimental observations. Vladimir Falko is Distinguished Professor and Head of Theory Division at Physics Department, Lancaster University. He works on theory of low-dimensional electronic materials, quantum transport in mesoscale systems, and fundamentals of nanoelectronics. Since 2005, his main interest lies in modelling physical properties of graphene and graphene-based devices. Pagona Papakonstantinou is a Professor of Advanced Materials at the School of Engineering of the University of Ulster. Currently her group specializes on the fabrication and functionalization of low dimensional carbon based nanomaterials (carbon nanotubes. graphene, diamond nanorods) the characterization of their unique physical and physicochemical properties and the demonstration of these materials in biological sensing and energy areas. Research efforts are directed on engineering the structure of these carbon based nanomaterials and probing the local atomic environment by synchrotron light in view of understading their properties. 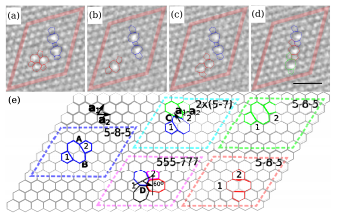 In a series of papers the details of the interaction of foreign molecules such as nitrogen, oxygen and chlorine with the graphene lattice have been investigated by synchrotron based spectroscopies (NEXAFS, PEEM, XPS, VB). Pagona serves/(d) on various committees including Diamond Synchrotron Light Source, EPSRC College Panel(s), Royal Society International grants and National Access Programme (SFI) at Tyndall Institute in Cork. She is author or coauthor of more than 75 scientific papers and is recipient of a Leverhulme Trust Senior Research Fellowship (2011) from the Royal Academy of Engineering. Electronic systems today generate a large amount of heat due to increased demand in miniaturization and more functionality. According to Eric Pop, out of the total electricity used for running data servers in USA in 2006, Over 50% were used to cool the systems. Similar to the rest of the electronics industry, mobile communication electronics hardware for instance, radio-base stations are also producing a huge amount of heat that has to be dissipated. Next generation radio base stations consist of more than 5-6 DSPs in many cases (each of them produces more than 5-6 W on a size of less than 0,25 cm2) dissipating roughly 30 W per radio base station unit. Locally, the heat intensity can be up to 25-30 W/cm2 in this case. With this constant heat generated, it is obvious that mobile communication electronics industry has also to look for new cooling technologies to manage the heat dissipation. The above-mentioned is just a few examples of the heat dissipation problems that are facing electronics industry. In fact, heat dissipation provides great challenges in many applications including also automotive electronics, power electronics and LED business sectors. In automotive electronics systems, single device can pump out up to 80 W continuously and in transient stage up to 300 W (within 10 nanoseconds). LED devices can have heat intensity between 1000 and 2000 W/cm2 due to its extremely small size. Therefore, we anticipate that thermal management of heat dissipation will be of strategic importance for the development of many future products. To cope with this issue, we have developed a number of carbon nanotube thermal management technologies such as dry densification of carbon nanotube bundles, rapid and low temperature transfer of carbon nanotubes using Indium as well as vertical interconnect using Carbon Nanotube based TSV concept for thermal and electrical path. Major publications are Fu et al, Adv. Mat, DOI: 10.1002/adma.201002415, Wang et al, DOI: 10.1002/smll.201100615, Wang et al, DOI: 10.1016/j.carbon.2010.06.042.